Vector Industries has a message for state and federal bureaucrats: we’re not a sheltered workshop. Vector Industries CEO Chrissy Johnston, right, talks with Del. Steve Landes, Del. Dickie Bell, Del. Ben Cline and Wendell Coleman, a member of the Augusta County Board of Supervisors. “The message that we’re trying to get out there is that Vector is a wonderful asset to the community that fills a couple of important roles: in the work that Vector Industries does for business clients, and giving our employees with disabilities who work out there on our floor the opportunity to contribute,” said Chrissy Johnston, the CEO of Vector Industries, a Waynesboro-based non-profit that employs and trains persons with diverse disabilities to enable them to reach their potential as productive community members. 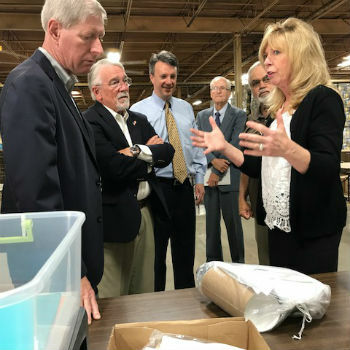 Vector Industries hosted a facility tour on Monday for a trio of members of the Virginia House of Delegates – Steve Landes, R-Weyers Cave, Dickie Bell, R-Staunton, and Ben Cline, R-Rockbridge. The pitch from Vector wasn’t for money, but rather, opportunity. “We have more than enough work right now. Our problem is not having enough employees to be able to do the work,” said Johnston, citing changes in federal law handed down in the 2014 Workplace Innovation and Opportunity Act, and 2016 federal regulations adopted by the Obama administration defining competitive integrated employment for people with disabilities. In the aftermath, employee referrals from the state Division of Aging and Rehabilitative Services have essentially come to a complete stop, Johnston said. At issue is employment under Section 14(c) of the Fair Labor Standards Act, which allows employers to pay employees with disabilities affecting their productive capacity at rates below the federal minimum wage. Any employer can hire employees under Section 14(c). The push since the passage of the 2014 Workplace Innovation and Opportunity Act is to have those with disabilities gain employment in what would be considered integrated work settings. Vector Industries could be considered an integrated work setting, with 100 employees, including disabled and non-disabled, 23 of whom are paid at sub-minimum wage rates under the 14(c) program. Why it is not considered an integrated setting: its mission. Vector Industries was founded in 1969 with the mission to provide employment opportunities for residents of Waynesboro, Staunton and Augusta County with disabilities. As a result, bureaucrat types consider Vector Industries to be a sheltered workshop. “We’ve actually been advised to alter our mission statement to not say anything about employing people with disabilities,” Johnston said. Bell, a special education teacher in the Augusta County school system for 10 years before being elected to the House of Delegates in 2009, left the tour with a homework assignment. “What we don’t know is why the referrals have stopped. I think that’s probably our challenge leaving here, to find out what’s going on, because there’s a problem, a glitch in this system, somewhere. This should be the kind of thing we embrace,” said Bell, who ran into a former student of his at Riverheads High School on the tour. Landes is on board with that. “When you see what they’re facing here at Vector, it’s pretty clear that the way the Division of Aging and Rehabilitative Services is interpreting the federal rules is hampering the mission here. We have to figure out a way where we can get things back to the point where they can refer individuals to this facility and facilities like this around the state,” Landes said. “Doing this is more beneficial to the state because the state Medicaid waiver program is very expensive. Those are important services that those individuals need, but if the individual can work part of the day or part of the week, that means they’re not in a day placement, which is expensive, it means their family members don’t have as much pressure to take care of them, so they can go to work or have respite. It really benefits everyone,” Landes said. “These are hard-working citizens meeting the needs of local businesses, and doing it in a fantastic way. The quality is top-notch. And the workers are happy. For the federal government and the state government to steer away from this type of operation is discouraging. We want to reverse that trend. We want to bring employees back to facilities like this, instead of forcing them to sit at home with nothing to do, and a declining quality of life,” Cline said.